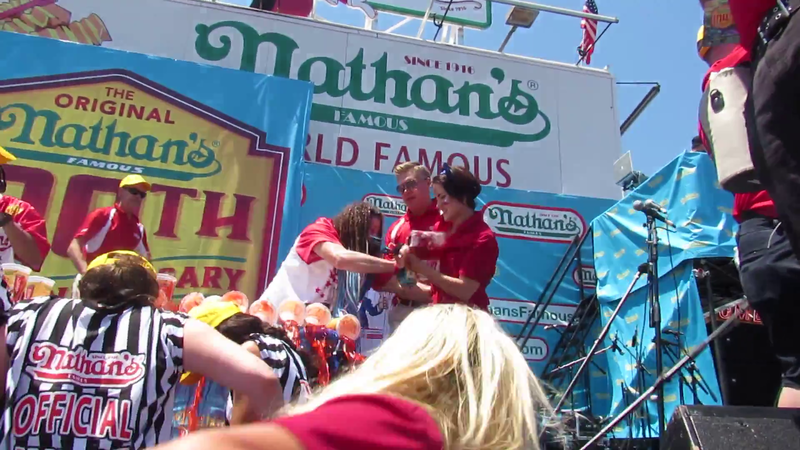 I would say my most accomplished moment in activism was when I was a part of the group that disrupted the Nathan’s hotdog eating contest. It went pretty much according to our plan and got a lot of media attention. 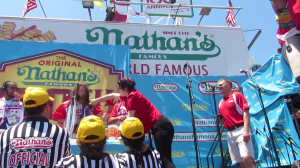 A video of the full ESPN broadcast of the 2016 Nathan's finals is available on youtube. Direct Action Everywhere disrupted yesterday's Hilary Clinton rally in Des Moines to protest her relationship with wholesale club Costco (video) The vegan activist group previously stormed the stage of last month's Nathan's Famous finals and June's Chicago Ribfest eating contest. milb.com announces that the Brooklyn Cyclones renaming themselves the "Coney Island Franks" on July 3 in honor of Nathan's Famous 100th birthday was awarded minor league baseball Promotion of the Month for July. Val Bromann has uploaded galleries of the men's and women's 2016 Nathan's finals. Press of Atlantic City has an article about Carmen Cincotti's third place finish in the men's Nathan's finals. update Jul 6 Brian Dudzinski has a video talking about the invasion of the left side of the stage. Fake blood was thrown on his food and his & Noelle Morgan’s son was knocked over. update Jul 5 “Sentiocentrist” admitted throwing blood in this instagram caption. Dan “Big Cat” Katz said he will seek legal action following the admission. The group Direct Action Everywhere has taken credit for and produced a video of their stage invasion of the Nathan’s finals at https://www.youtube.com/watch?v=z3YViml5lXo. First a woman climbs on stage and throws fake blood on Crazy Legs Conti (Dan “Big Cat” Katz also gets hit). During the commotion, a blonde woman and two males climb on stage. The Daily Mail has an article about the incursion. Here are some screen captures of the assault (click on images for full size). If have archived the video in case it gets deleted. WDBJ has an article on BeeJay Alexander's surprise 5th place finish in the women's Nathan's finals. The Daily News has an article about the attack. Three protestors, who disguised themselves as fans, were taken in to police custody after taking the stage. Protesters also apparently tried to jump Crazy Legs Conti near the start of the contest which required police intervention. This is probably the reason for the one hot dog performance. Dan Katz reports that protesters from PETA knocked over his plates and threw fake blood on him. This will be a big hour for Bay Area sports. 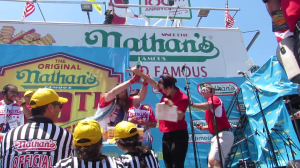 Kevin Durant has decided to join the Golden State Warriors and San Joseans Joey Chestnut and Matt Stonie should finish top 2 barring a shocking upset. 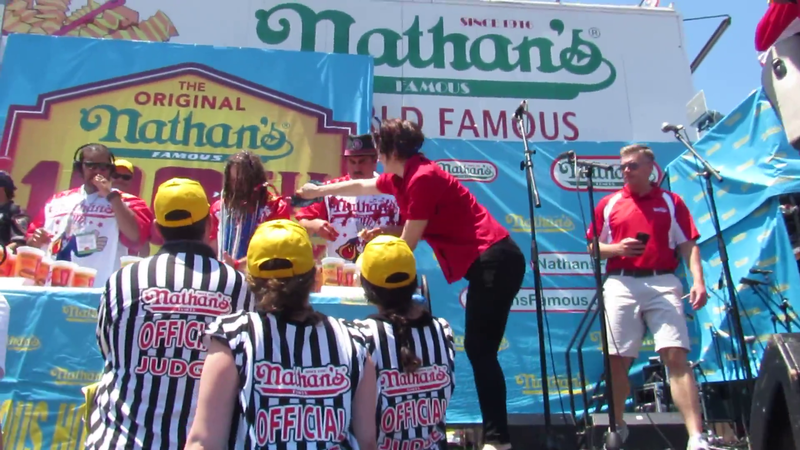 Miki Sudo ate 38.5 hot dogs to win the women’s division of the Nathan’s finals for the third year in a row. Sonya Thomas was the runner up with 35. Hopefully we will get full results promptly since all finishers will receive prizes. The Root has a profile of Gideon Oji. 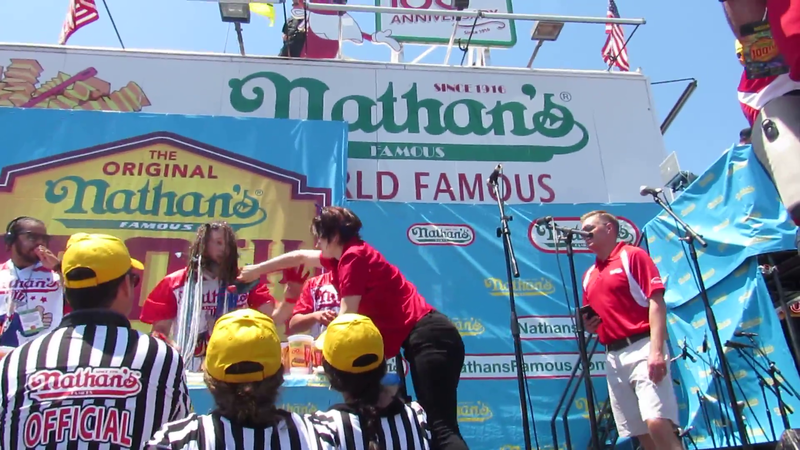 Travel and Leisure has an interview with Hilary Andrews, the female winner of the final Nathan's qualifier held in Washington, DC. Clayton State Sports has an article about Gideon Oji's return to the Nathan's finals. 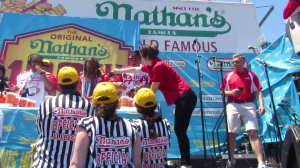 Matt Kiebus has a report and video for BuzzFeed about competing in the Nathan's qualifier at the Mets ballpark last month. Rich Shea announces that places 6th-15th in the Nathan's finals will pay out $500/$450/$400/$350/$300/$250/$200/$150/$100 for both men and women. The total payout of $45,500 will make it the 2nd most lucrative event in MLE history after the 2009 Krystal Square Off. 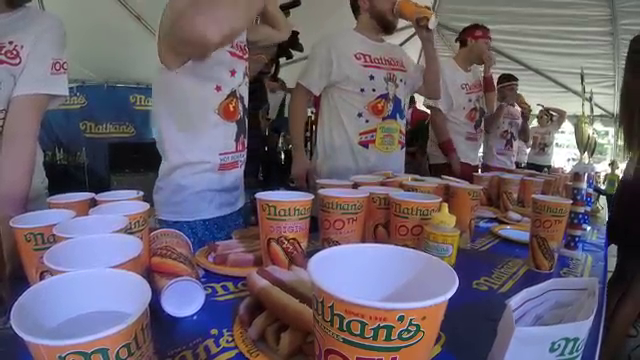 The Washington Post's DC Sports Bog has a report on Saturday's Nathan's qualifier in Washington, DC containing an interview with Joey Chestnut. Here is a complete list of all people who have qualified or received byes to compete in the 2016 Nathan’s finals. It is possible there will be some no-shows. The Brooklyn Paper has an interview with Joey Chestnut, who partially attributes his 2015 Nathan's finals loss to the breakup of his relationship with Neslie Ricasa after their engagement during the 2014 Nathan's finals. "Big Cat" of BarstoolSports.com annouced he has received a sponsor's exemption in the Nathan's finals from Rich Shea. The UT - Rio Grande Valley student paper has an article about Kassie Zapata competing in the Nathan's finals. Her status as a college student could justify showing the women's Nathan's finals live on ESPNU. The Brooklyn Daily has an article and video about Crazy Legs Conti eating hot dogs on top of a Wonder Wheel car Friday. During the revolution, he managed to eat 12 hot dogs in 3 minutes and also had to duck to avoid being hit by another car. Posts © 2005-2019 ojrifkin · Original design by Beccary · Sponsored by Weblogs.us · XHTML · CSS 20 queries. 3.239 seconds.